I intended to write this post nearly four months ago. I suppose better late than never. Since acquiring this milestone card, the collection has increased by another 250 cards. Over the past five years, I’ve slowly rebuilt that portion of my collection. It probably would’ve gone much more quickly if I hadn’t devoted so many resources to acquiring the ridiculous number of cards that I originally missed out on during the 2004-2009 timeframe (especially 2005), when I had to be far more selective about what I collected. I’ve managed to reassemble the Play Ball sets, the ’55 and ’56 Topps sets, and most of the Bowman team sets, but the majority of the team sets I once owned remain works in progress. Some of them I may never complete again; in particular, I just don’t see how I’ll ever manage to reacquire a T206 White Border Titus—the remaining card I need to complete that particular team set. On the other hand, I’ve been fortunate enough to pick up some cards I didn’t own (let alone imagine owning) 10 years ago. I now possess a few Cracker Jack cards, some caramel cards, a few exhibits, a Tattoo Orbit, and even a few pins. 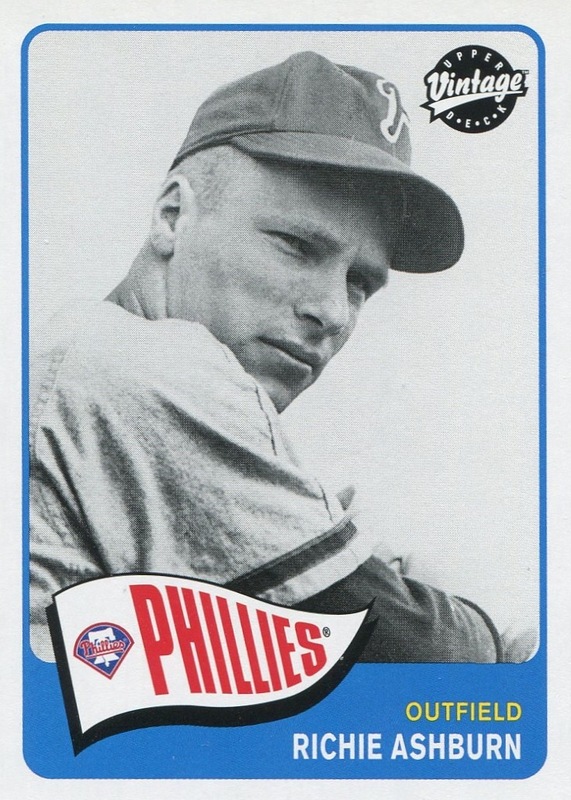 The presence of these cards in my collection more than offsets the OCD angst caused by the fact that I still need to complete many pre-1954 Phillies team sets. Nonetheless, the completion of some of those sets remains a serious goal. 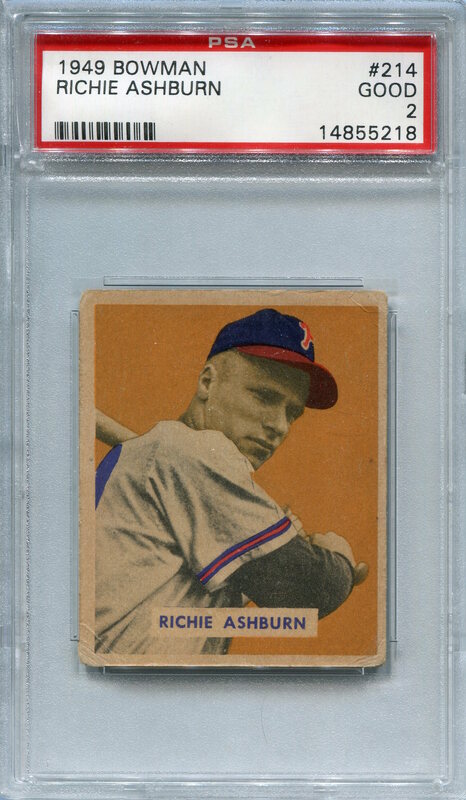 One such set was the 1949 Bowman, and it probably comes as no surprise that the Ashburn rookie card was one of the final cards I needed to complete it. Of all the cards I sold during the 2003-2004 winter, the Ashburn’s rookie card was the one that hurt the most when I sold it. I actually only owned it for roughly a year at the time, but it was easily the centerpiece of my collection. It wasn’t in the best condition (it was professionally graded by SGC as a 40), but I was thrilled with its overall appearance. Yet, at the time I felt confident that I could require it somewhat easily once I again possessed the resources to do so. 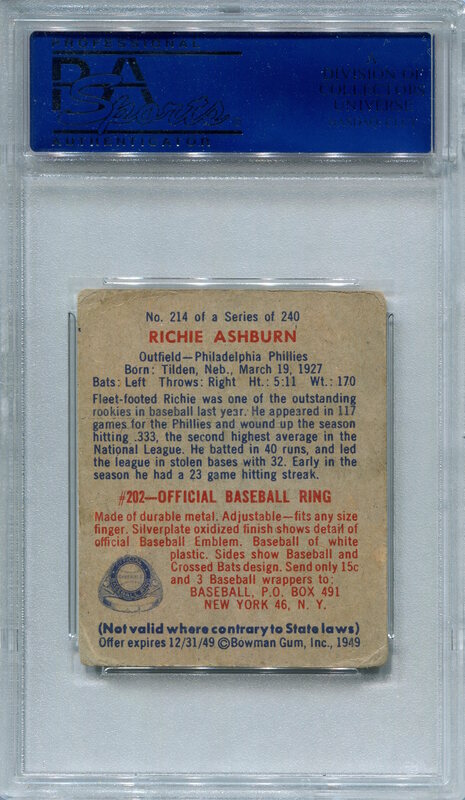 Roughly 18 months ago, I started actively searching for another 1949 Bowman Ashburn card professionally graded in VG or VG-EX condition. Unfortunately, this turned out to be a card that more than held its value—it was more expensive that it had been when I bought and sold it 10 years earlier (even when factoring inflation over that time). I quickly resigned myself to the idea that I would need to accept one graded in Good condition. Even then, it took a great amount of patience. Finally, around the time I was approaching the 20,000 milestone, one finally hit eBay at a price relatively near what I was willing to pay. Thankfully, the seller had a “Make Best Offer” option on the “Buy It Now” price and I was able to negotiate the card down to the maximum I was willing to pay. 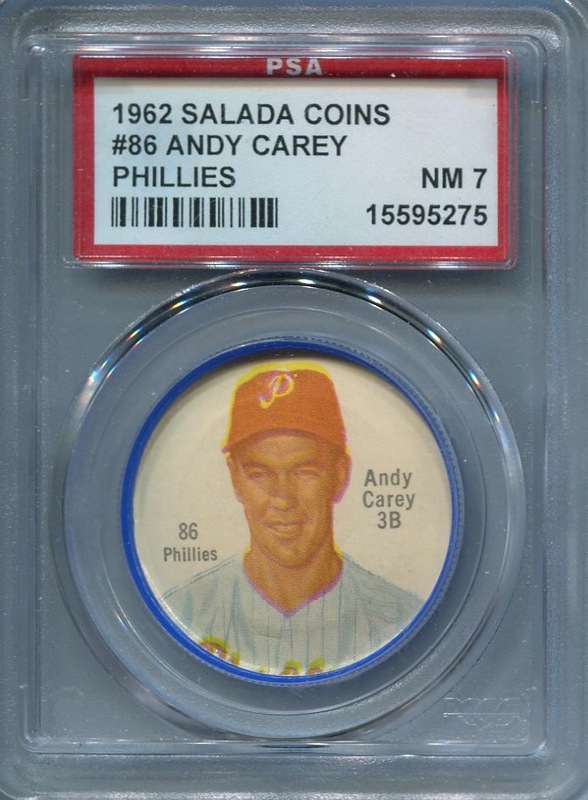 So, once again it’s a centerpiece to my collection, and although it wasn’t technically the 20,000th Phillies card in my possession, I made sure that it was the 20,000th added to the Excel spreadsheet I use to track my collection. It’s not as nice as my original Ashburn rookie card, but at least I own one again (which is more than could very well be said about the T206 Titus.) 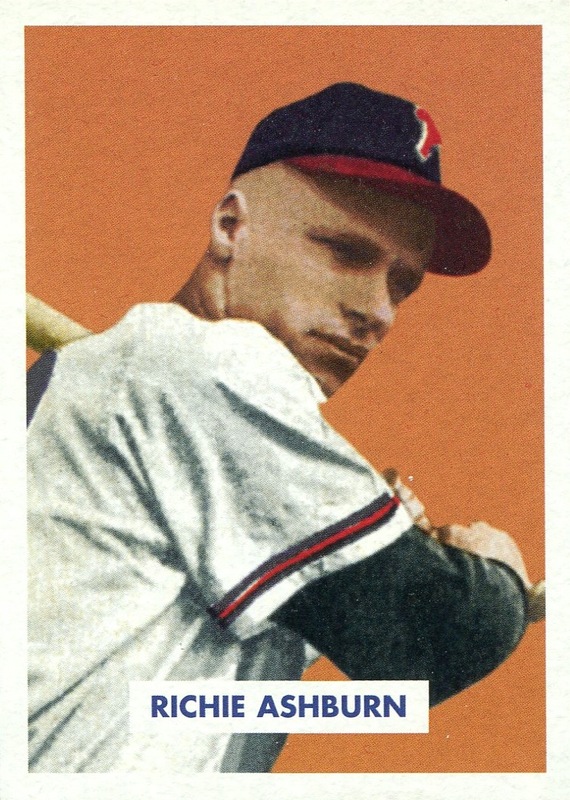 Just as nice, it meant that it put me just one card away from completing my 1949 Bowman team set—the completion of which I described yesterday. 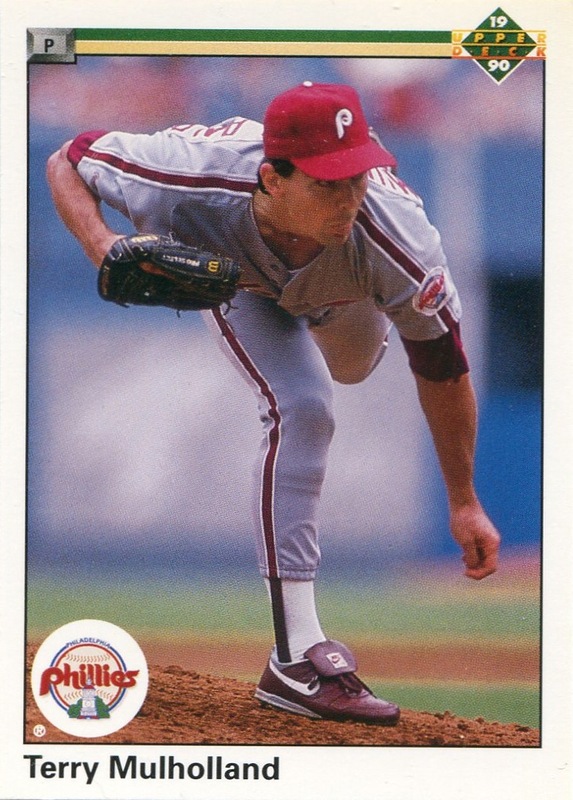 If you told me 30 years ago that one day I would own over 20,000 Phillies cards, I might’ve believed that it potentially could happen sometime significantly later in life; I just don’t think any of us back in the mid ‘80s could’ve possibly anticipated the radical changes in the hobby that would begin around the start of the ‘90s and continue to this day. Barring a catastrophic collapse in the hobby or my finances, 30,000 seems incredibly likely at some point down the road—as mind-boggling as that possibility seems. 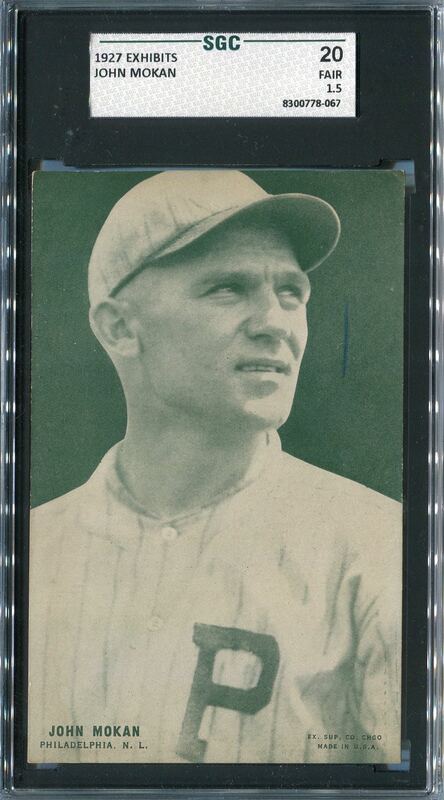 Update, March 3, 2014: I have posted an update and correction to the information on the Kendrick card below. 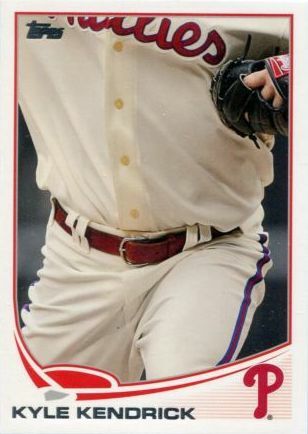 When Topps released its 2013 Update Series, it included what might be the ugliest, stupidest, and downright most insulting baseball card ever: the Kyle Kendricks “error” variation. 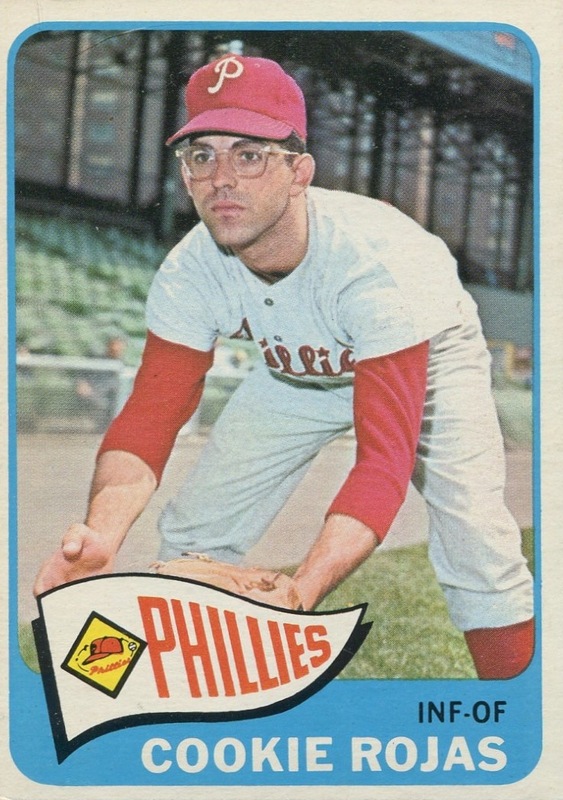 I’ve collected all the Phillies veteran and photo variations issued by Topps since they started issuing them, but this particular error gimmick is beyond the pale. 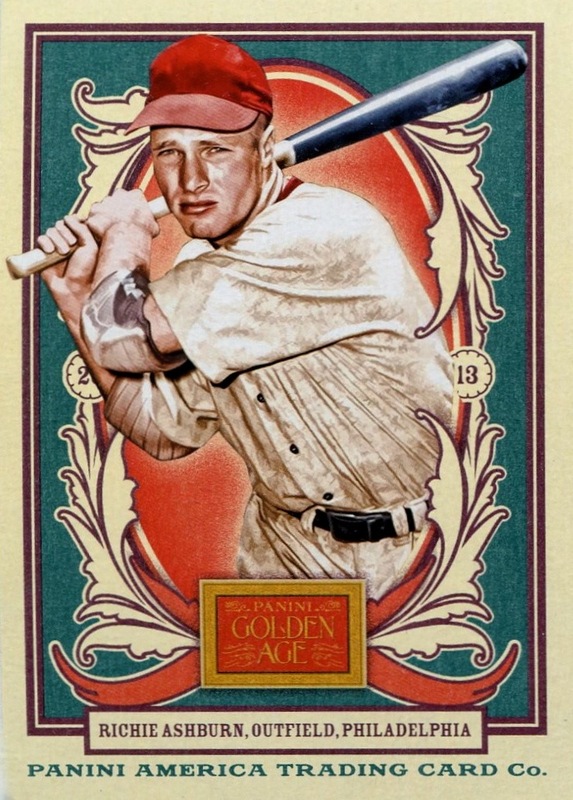 I cannot even begin to comprehend why anyone would think this was a great idea for a card — has any major card company ever issued a card in error that was so badly cropped that the player’s face wasn’t in it? No, it’s never happened, and it never will happen because it takes so many layers of incompetency that such a card company would’ve already filed for bankruptcy before being able issue such an atrocity. Yet, because it’s so short-printed, every copy that’s shown up on eBay has sold for $60 or more. The fact that I have no desire to add it to my collection says an awful lot, because I’m just about as OCD as team collectors come. 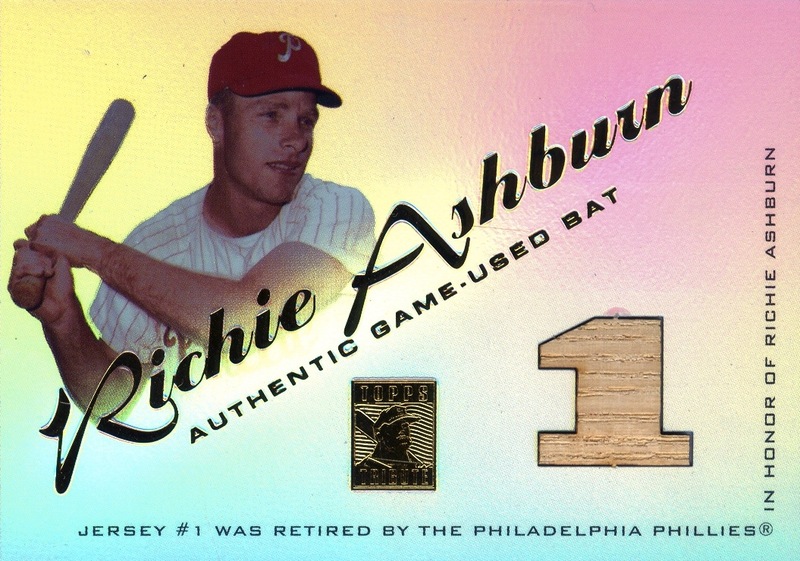 Yet, the disgust I feel towards Topps for this card pales in comparison to the animosity I harbor as a result of the Ashburn relic-cut autograph card that Topps produced for Heritage in 2009. 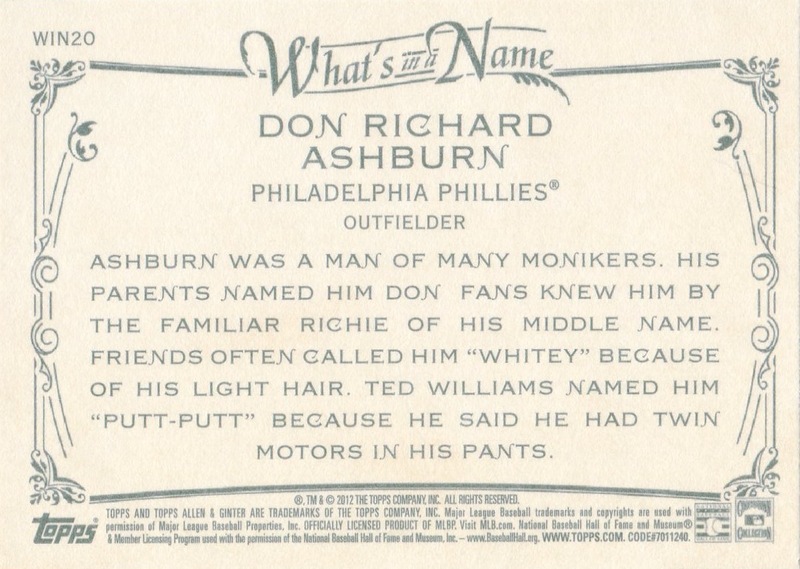 It was bad enough that Topps found an incredibly rare, (supposedly) game-worn Ashburn Phillies uniform and cut it to pieces (which ended up in a number of other inserts over the following years), but they added insult to injury by including it on a card that they designate him as member of the Cubs. 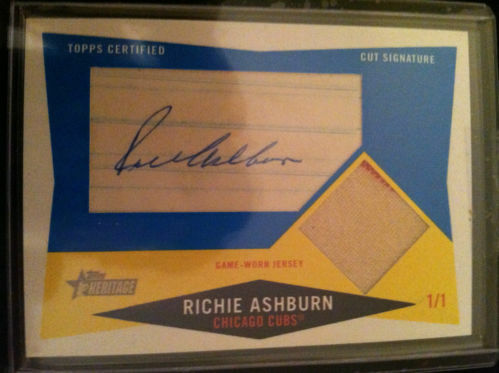 Yes, I understand that the 1960 Topps set, which 2009 Topps Heritage recycled, included Ashburn as a Cub. 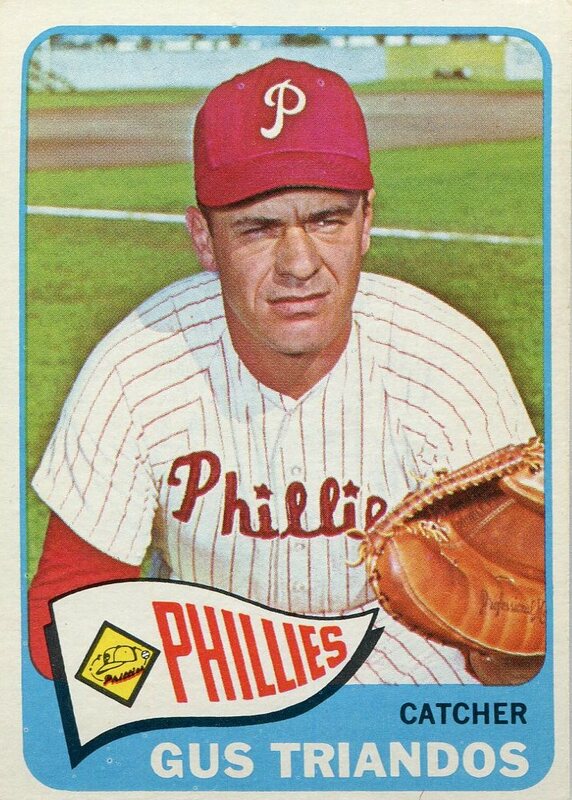 However, when you’re producing a 1/1 card of arguably the most beloved figure in Philadelphia sports history and that card includes both a cut autograph and a fragment of one his Phillies uniforms, you come up with a reason to make damn sure that the card designates him as a member of the Phillies. It’s crap like these two cards that offset all the joy I get out of cards like the John Kruk & Carlos Ruiz dual autograph card I wrote about yesterday. Additional Information: Inserted in packs of 2001 Bowman. 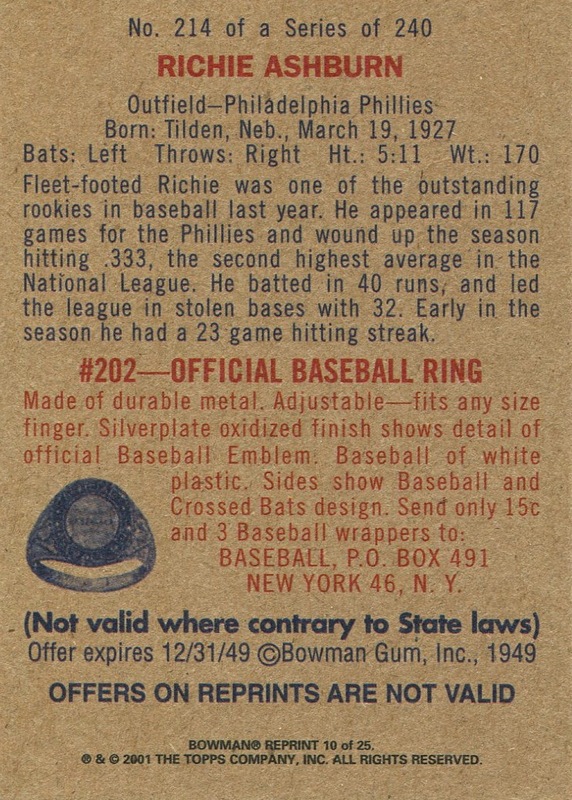 14,000 Phillies Commentary: First and foremost, I love the fact that Topps’s lawyers felt it necessary to include the “OFFERS ON REPRINTS ARE NOT VALID” statement at the bottom of the back. I realize that they need to protect themselves from the crazies, but would anyone in their right mind really think that they were offering rings again, the rings cost just 15 cents, and the offer expired in 2049? 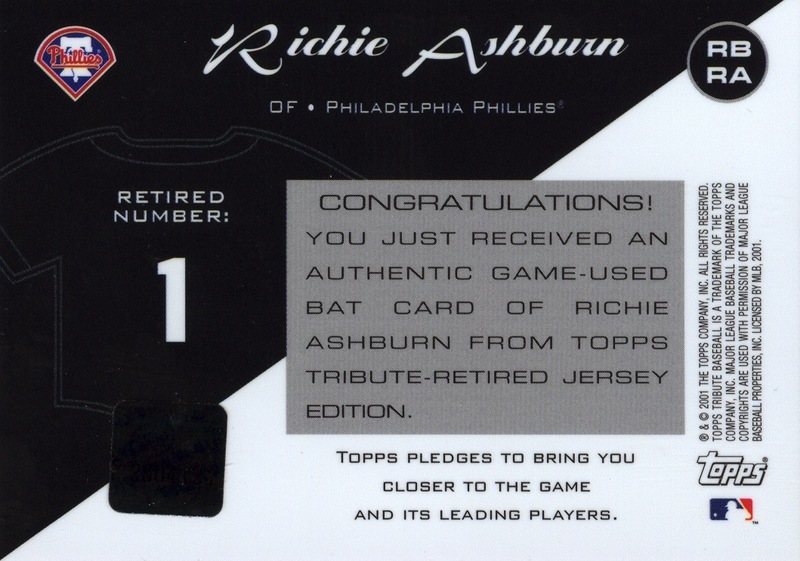 Second, I did at one time actually own an Ashburn rookie card. However, some incredibly tight finances roughly 10 years ago necessitated my selling it and I still haven’t been able to replace it. 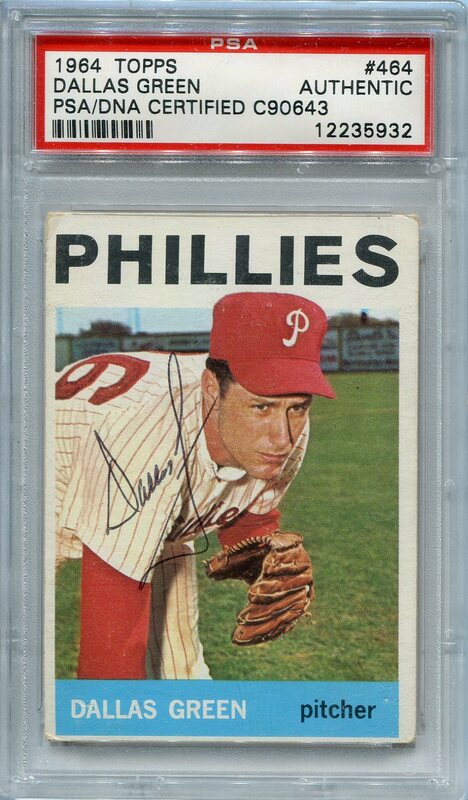 Hopefully, that will one day change, but it’s incredibly likely this is as close as I get to owning the Ashburn rookie card for a long time. 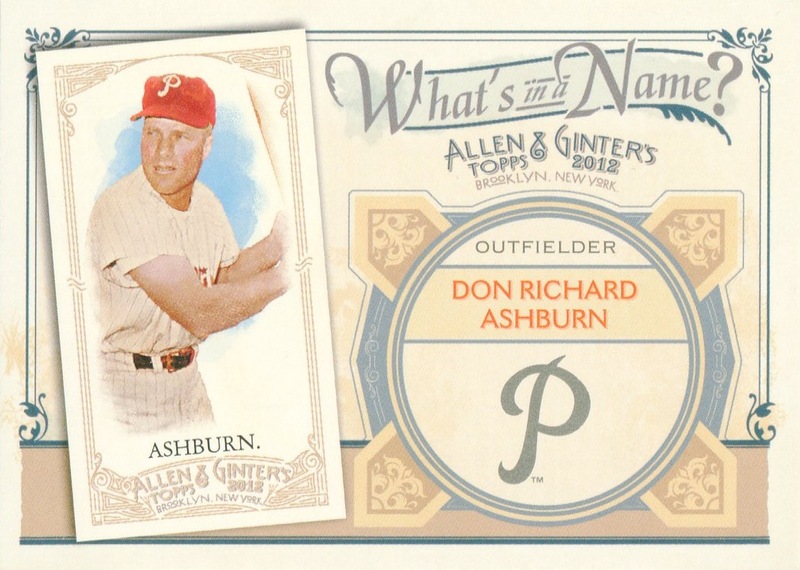 2012 Topps Allen & Ginter’s What’s in a Name? Additional Information: Cards were inserted in packs of 2012 Topps Allen & Ginter’s. All the cards in the set bear the player’s full given name. Parallel: Stencils; instead of swatch cut in the shape of the player’s number, the swatch is cut in the shape of a square, and the player’s number is cut out from the inside of the square, thus producing a stencil-like swatch. Presumably, the swatches from the regular cards were produced from the Stencil swatches.